In honor of Bernice Gordon, my friend and collaborator who died yesterday at the age of 101, there will be no regular post today; the blog will resume next Friday. I first contacted Bernice in March of 2013 about doing an interview for this site. Shortly thereafter, we decided to collaborate on a puzzle about age differences; that puzzle was published on June 26, 2013, in The New York Times. At the time, Bernice was 99 and the oldest living Times constructor and, at 16, I was the youngest; our age difference was 83 years. In September that year we met in person in Philadelphia—a meeting I wrote about here. I was on the East Coast briefly again this summer and one morning drove down from New Haven to Philadelphia to meet Bernice for lunch. We had a lovely meal, talked about crosswords, and played Bookworm on her computer until I had to leave late that afternoon for New York. All told, we collaborated on three puzzles; our second one appeared in the Times on August 11, 2014, and our most recent effort was, fittingly, accepted by her dear friend John Samson on November 11 and will appear in Simon & Schuster's Mega 15. Over time we became fast friends, exchanging more than 700 e-mails, all of which I saved; in the relatively short time we knew each other, she also became the grandmother I never really had. Lately we had both been writing every day or so, because Bernice knew she was dying. Even though my e-mails were short and usually of little import, I knew she loved getting them, and I hoped they would keep her alive longer. Bernice very much wanted to know where I would end up going to college, but in December, just a few days before I was to hear from my early action school, her e-mails to me abruptly stopped. I kept writing, and when I learned that I had been accepted, wrote to her right away, not knowing whether she would ever receive the news. Two days later, though, she wrote back—she was thrilled for me, and I was so glad she was alive. Even though she still didn't know for certain where I would end up, she knew it would be somewhere wonderful and told me she could now die in peace. We exchanged quite a few more e-mails between then and January 11—her 101st birthday and the day I received her last e-mail. I kept writing, hoping her e-mails would resume again, but they never did. On Wednesday, the night before she died, I sent her what would be my final e-mail. Very touching, David. A wonderful tribute to someone who will clearly inspire everyone in the crossword field. David - Your tribute brought tears to my eyes. So happy that you two met and melded. What a wonderful collaboration, clearly in more ways than words. How wonderful to find such a beautiful friendship at her age and yours. I'm sure you brought her such joy, David. Well done, David. A classy reminiscence. I remember that NYT collaboration puzzle, and am delighted to know that such a friendship grew across that huge age gap, from one common interest. Your correspondence was certainly a big highlight to her. Thanks for sharing this with us. David - You gave to Bernice the perfect senior citizen combination ... companionship and the guarantee that her life's work would continue. Thanks. God love you, David, for bringing so much joy to Bernice's life. As Richard noted, a classy tribute to a very classy lady. 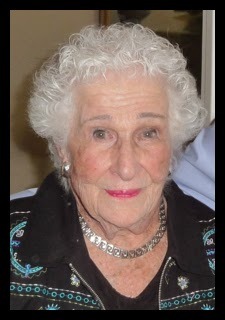 Requiescat in pace, Bernice…love you! It really is difficult to type with tears in one's eyes. This is so touching and sweet. It sounds like both of you gained a great deal from the friendship, and she'll be dearly missed. What a beautiful story. I think the world would be a better place if there were more deep friendships between the generations. Thank you for sharing it with us. Such an inspiring and heart warming story David. Thanks for sharing this. You have a beautiful soul, David, and I'm sure Bernice saw that in you, as you did in her. 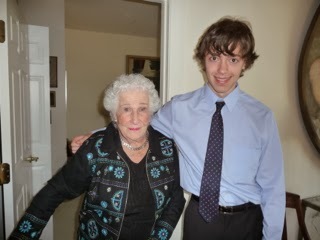 A very touching tribute to Bernice and to the power of crosswords to bring people together, even those 83 years apart. My wife Piljo and I were very moved. Thank you David. What a wonderful relationship you describe, David. Thanks for the tribute. That's a wonderful and touching remembrance, David. Thanks for sharing it on your blog. Your work and friendship with Bernice was a remarkable gift to her in final years. You're a remarkable guy. Congrats on the college news as well. Oh my...That brought a bunch of tears to my eyes. I'm so glad you and Bernice met up.....What a chance! Grandmotherly types are the best....they never tell you what you should do - just what you can do....! 2 brilliant minds connecting over the span of time. well done! From everything I've read and heard, Mrs. Gordon had a very long and good life. I am certain that your collaboration and friendship with her were the icing on the cake. You have performed the biggest mitzvah. Good luck with your college decision.